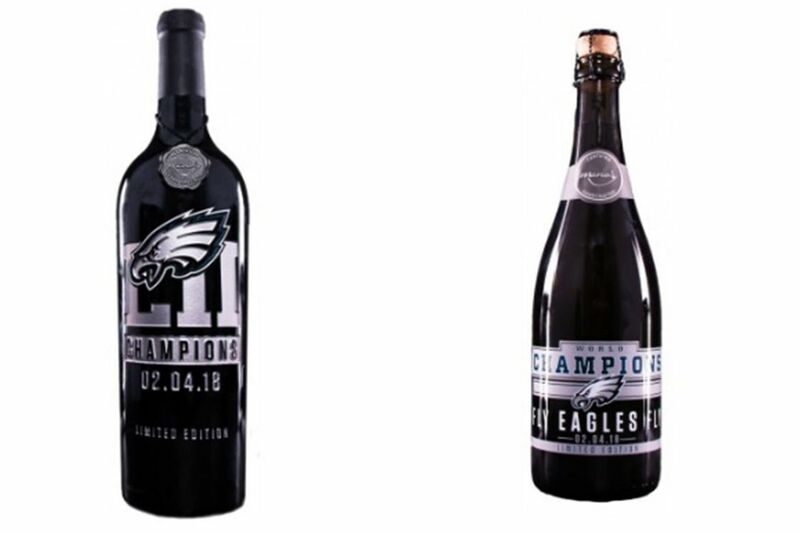 The Eagles-themed wine is available to buy online now and will soon be available in stores. Which pairs best with buffalo chicken dip – a red or sparkling white? Now you can test the options, thanks to commemorative drinks celebrating the Philadelphia Eagles and the team's first-ever Super Bowl win. The team has partnered with Mano's Wine, a Kansas City, Mo.-based winery, to make "Championship Red" and "Championship Bubbly," which are available to purchase online now. The beverages will soon be available at Fine Wine and Good Spirits stores, grocery stores and other wine retailers in the area, the Eagles said in a press release. "The 2017 season marked a truly historic milestone in Philadelphia Eagles history," said Eagles President Don Smolenski in a statement. "We felt like this celebratory wine bottle was the perfect way to commemorate our world championship season with Eagles fans everywhere!" For $50, "Championship Red," a blend of Central Coast Cabernet Sauvignon and Monterey Merlot that's described as a "medium bodied, dry red with a smooth finish," could be yours. Mano's also has a sparkling white wine "with hints of green apple, peach, lemon and floral aromas" donning the Eagles logo selling for about $25. The sports homage is hardly new for Mano's, which has a wide selection of MLB and MLS wines available for sale on its website — yes, that includes bottles paying tribute to both the Philadelphia Phillies and Philadelphia Union. As for the early social media reception? Mixed, but not without at least one Patriots-related joke. Umm... ok? But we’re really not a wine drinking crowd. One question, didn't we already get enough wine out of the patriots after we won??!! "We are extremely excited to work with such a great organization and one of the most passionate fan bases in the NFL," said Mano's Wine owner Kyle Rensenhouse in a statement. "This was a sensational season for the Eagles and we are ecstatic to be a part of this historic celebration." It's not clear how long the commemorative wine will be available.